Last September, our area was devastated by severe flooding from the Susquehanna and other surrounding waterways. The historic Bloomsburg Fairgrounds sat under eight feet of water. The damage was so bad that they had to cancel the fair last year, which has been running for over 150 years. 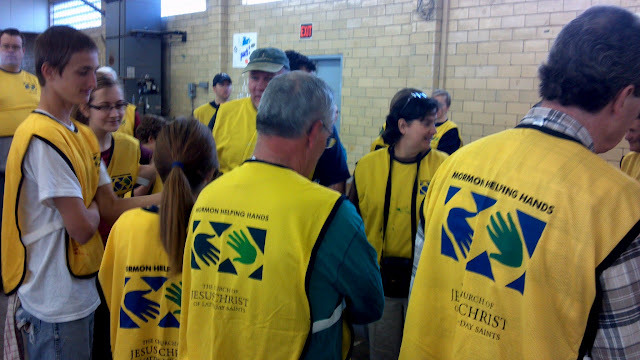 This weekend, members of The Church of Jesus Christ of Latter-day Saints in central Pennsylvania came together to perform a day of service. 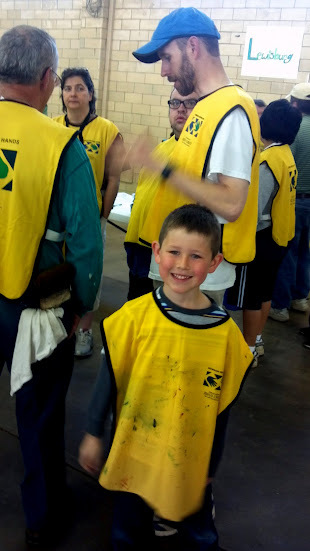 Our "Mormon Helping Hands" painted benches and bandstands, cleaned up water-damaged storage facilities, and helped bring the fairgrounds back into working condition. Honestly, I wasn't super excited about leaving my house at 7am on a Saturday, but I must say that I am glad that I did. Our group painted and painted and painted. In the end, we could really see the good that we accomplished. Beautiful green benches and paint all over our clothes. I especially felt the Spirit confirm to me that God was pleased with our efforts during the remarks made by representatives of the fair. 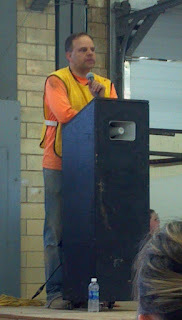 The service day organizer encouraged us to "remember the special feelings we felt today." "Although the sun was hidden behind clouds today, God was smiling down on us. He was definitely part of the proceedings today. There is no doubt about that. Thank you for the good that you have done. You will never know how much it means to us." "We will NEVER forget you." I will never forget you. This is the effect that service has on others. I have never forgotten certain people who have reached out to help me at crucial moments in my life. The Savior served us, and for his sacrifice, we must "never forget" Him. And this is why we serve...to honor the service that Jesus Christ performed for each of us. There was indeed a special spirit there today. A spirit of love and friendship and appreciation and unity. I am thankful to our stake president who encourages us to unite in a day of service. This yearly event has become a beloved tradition in my heart, and I am glad that my children are beginning to be able to participate as well. I agree. Service has gotten me through many tough times. It was lovely to read of your service project and the effect it had on participants and those receiving the service. Thanks for sharing! Hurray for Mormon Helping Hands. We LOVE it.